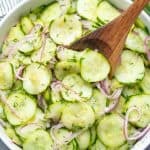 This Easy Cucumber Salad recipe is a family favorite recipe that people have been enjoying for ages. 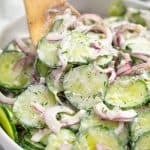 Thinly sliced cucumbers and onion are tossed in a sweet and tangy vinaigrette for a classic side dish. 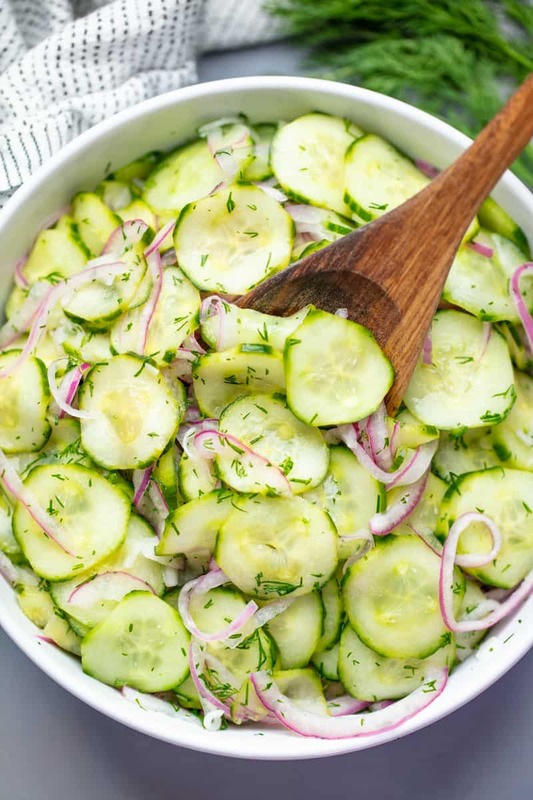 Cucumber Salad is a total classic! This particular recipe is heavily rooted in my German ancestry where they call it Gurkensalat. It’s a popular side dish that has made its way to America. It’s light, refreshing, and easy to make. There are two different versions of Cucumber Salad that you might find, one having a light vinegar sauce, the other being a creamy version. This recipe is for the light vinegar version. 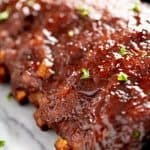 A creamy version would have a sauce made with sour cream, dill, garlic, sugar, and a little vinegar. Both vinegar and creamy versions can also be commonly found in southern cooking. 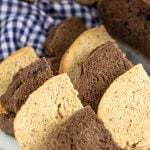 While the recipe seems to have originated in Germany, it made its way to the Southern United States via German immigrants. There are slight variations out there, of course, but this version is my favorite. What kind of cucumber should I use for cucumber salad? English cucumbers have more flavor and less seeds and a perfect match for this recipe. If you don’t have access to English cucumbers, you can use regular seedless cucumbers. Since they are smaller, you will need to double the amount that you use. SWEATING CUCUMBERS: This recipe calls for “sweating” the cucumbers. When sweating a vegetable you use salt to draw out excess moisture. This is commonly done when working with eggplant. You can certainly skip this step in the recipe, however, you’ll end up with extra liquids from the cucumber, which have a high volume of water content. What kind of onion should I use? Not only do they add some good color, but red onions are also perfect for eating raw. Be sure to slice them as thinly as you can. If you don’t have a red onion you can use a white onion in a pinch, but the onion flavor will be more prevalent. A yellow onion is not recommended. Can I use dried dill instead of fresh? Fresh dill is strongly preferred in this recipe. If you can’t find fresh dill or don’t have access, you can use dried dill. 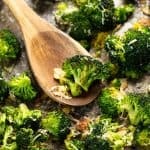 Use only 2 to 3 teaspoons of dried dill. PRO TIP: Use a mandoline slicer to cut the cucumbers and onions in this recipe for even slicing that’s razor thin. 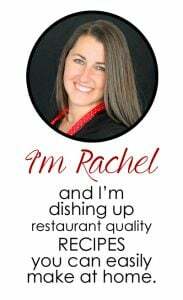 Watch the video below where I walk you through every step of this recipe in my very own cooking show. You can find the full collection of video recipes on YouTube or browse them right here on my website with their corresponding recipes. Season cucumbers with salt in a large bowl and let sweat 1 hour. Drain liquids and toss cucumbers with onion slices. In a small saucepan over high heat, pour in white vinegar and water and stir in sugar until dissolved and liquid turns clear, 3 to 5 minutes. Pour over cucumbers and onions. Stir in dill. Cover with plastic wrap and refrigerate 1 hour. Serve cold or at room temperature. I used to make this every summer when my son was growing up, just like my mother did when my sister and I were growing up. This is basically the recipe we always used though I sometimes make it with cider vinegar and put in a little fresh basil as well. Do you pour mixture over while it is hot, or let it cool first? While it is still hot. I LOVE this salad. My grandmother lived on a farm and had this every time we visited her in the summer. can you add feta or goat cheese? Sounds delicious to me! I’d add right before serving. 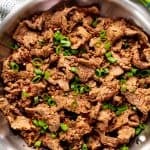 Have you ever used stevia to make this low carb? I’m wondering if it would taste the same? I haven’t but it is worth a try! I made something similar to this with stevia a while back and it was NOT good. I would use Swerve or something (I think that is both stevia AND erythritol, mixed). 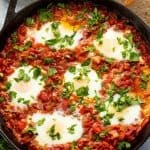 Delicious and so simple and easy. Thank you for sharing. 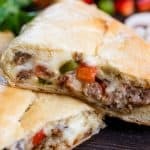 Just made this tonight and it was absolutely delicious! My husband ate almost the entire bowl! It will stay good for at least several days. 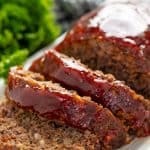 Do you drain off the sugar/vinegar/water liquid before serving? You can if you’d like. I just leave it.